Start any day off right when you serve Steep by Bigelow organic fair trade English breakfast tea! This pure and simple blend bursts with full-bodied, smooth flavor. When brewed, it has a malty rich aroma and medium amber color. The caffeine content of the black tea provides the pick-me-up your guests need throughout the day. Steep by Bigelow organic teas, such as this fair trade certified organic Ceylon tea, are grown using only natural fertilizers that are free of synthetic pesticides and additives. Purchasing fair trade tea helps promote sustainability and greater equality through international trade. delicious yet subtle, I'm a new fan of the Bigelow (all it took was one order) and now I'm a diehard fan, absolutely delish !! Steep by Bigelow is starting to become a staple for us at Rebel Raw! This english breakfast is such a hardy cup of tea, and is perfect during any part of the day. The flavor is so deep and lush. I recommend this tea to anyone and I think coffee drinkers will enjoy it as well. These teas taste great! One fo the best parts of this tea is the packaging. The packaging is very aesthetic. You put these out on display and they sell! First customer in our new shop grabbed this one and she has come back every morning for it! Love the flavor and price of these teas for our small shop! every one of my customers loves this organic english breakfast tea. it is very bold and delicious. It has become a staple on my menu. This is a great option if you use tea bags (rather than loose tea) and you want to go organic. It tastes great and Webstaurant has the best price! Even the artwork on the box is pretty...This is a good English Breakfast tea. This is a great tea! Good flavor and our customers love it! We use it at our coffee shop. Look for the Steep merchandising racks also. Steep Organic Tea series are offering you a different experience in between tea bag choices. Fast steeping shortens the time for brew and helps you to serve your customers fast. Customers who are not coffee drinkers love the Steep Bigelow Organic English Breakfast Tea . The Box holds 20 individual tea bags nicely pack and the box has an opening for customers to easily grab their tea and the image on the box is very vivid and nicely shown. Delicious tea, customer favorite every time. Easy and quick to make just add to hot water and let sit for 3-5 minutes. Tea is delicious everytime. This is a flavor that goes well with breakfast and pastries. I love the smooth taste and the aroma. The tea stays fresh in the foil-sealed packets rather than regular paper ones. I love Bigelow teas! Not only does this Organic English Breakfast Tea have a great flavor, but it is also nice and relaxing. The box is perfect for displays racks. This is a high quality tea perfect for breakfast or any other time. Dispenser box is ideal for a break room or café looking for a great tasting tea. This organic English breakfast tea has a delicious, bold flavor. I add honey to it and make it a low calorie beverage that I enjoy with breakfast. The Steep by Bigelow organic English Breakfast tea is awesome. I love it in the mornings instead of coffee. The flavor is great and creamy. A nice addition to our bed and breakfast. This is a great tasting breakfast tea that can be enjoyed anytime day or night. This box contains 20 individually wrapped tea bags which is a great deal. This is a great Breakfast Tea, & displays very well in our coffee shop. It is a huge plus that it is organic, & the price is very very reasonable. We would recommend any of the Steep brand teas, they are wonderful! I just love this English Breakfast flavor tea from Bigelow. These tea bags are perfect for any restaurant, café or motel. With 20 tea bags per box, this is a great value. Im a sucker for boring old black tea. It will always be my go to, even though i enjoy other varieties too. This organic english breakfast tea is really great. the steeps nicely and tastes great too. i love the dispensing box, i have this and other flavors displayed in my coffee bar and the look so nice compared to most tea boxes. The fact that it is organic is a huge added bonus. it's is not the most affordable option but i will definitely continue to spend the few extra dollars for this! 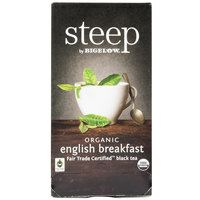 Steep by Bigelow Organic English Breakfast Tea tastes amazing and has a tantalizing aroma. It seeps well and isn't too strong. Recommended for restaurants and home use. I really like Bigelow teas and the Steep brand is one of my favorites. This English Breakfast tea is organic and fair-trade certified. An added bonus is that the packaging is beautiful! These are ok especially because of low price & ability to buy in bulk. Flavor is not super strong but all in all not bad. Steep organic English breakfast tea is one of my favorite teas. I serve it every time we have a luncheon because it is everyone's favorite. It is smooth and creamy and great with sugar and honey. This is my morning pick me up tea. Mixed with a little bit of honey and i'm on the go! Very good taste, and love it strong, so I steep a little longer than most! Love that their products are organic and will never buy another brand besides Bigelow! Organic is the very popular term that a lot of people look for when buying a product. I was happy to find an organic enlgish breakfast tea that was reasonably priced and flavorful. This tea is great in all aspects and your guests will love it. This earl grey tea is very different than other earl grey tea. It it like a black tea but also has citrus/lemon flavor in it. Great subtle tasting english breakfast tea. I was never a big fan of any of the English teas until I tasted this one. An absolute must try! Classic Bigelow Teas are wonderful, and the Steep Organic teas are equally as great. This is a beautiful classic english breakfast at a great price. The flavor is rich and the packaging really sells it. This is just as good as the Bromely English breakfast tea I ordered, but I like that this is organic. Good price for 20 tea bags. Great tea with full flavor! It taste just great. This tea is a great example that it is a great idea to buy organic! I would recommend this product! I can't describe how much I love English tea! This Steep version is no disappointment. I enjoy the organic nature of the tea, and have several other flavors that are also equally delicious! I have all those offered by Webstaurant because they are that great! Organic tea is on top of the list of healthy teas for you to drink. I like that i can get organic tea options from websturant supply. Sir clean recommended this product Steep By Bigelow Organic English Breakfast Tea - 20/Box, this tea is really good, the flavor is delicious, we like the price and quality. Another wonderful tea from steep this organic English breakfast is great good flavors can go wrong with these sometimes you just Gotta have a spot of teA! Black teas are generally mild to extreme in taste. This one is one of the extremes. The flavor is bitter and pungent with really not a whole lot going on. I don't like the flavor but it's barely drinkable because it's so strong. We appreciate your review, Jaimie! If you are looking for more information on the product that you are purchasing, please contact our Customer Solutions team. Out of all teas, English Breakfast has always been my favorite. Bigelow brand makes one of the best. I highly recommend this for its great flavor and great price. As a tea drinker i have to say this tea is great. I am using this brand of tea in my bakery to be paired with different bake good. This high quality tea is full of flavor and character. It's a fantastic product at an even more fantastic price. Highly recommend this whole line of tea! This is a mild flavored tea that I feel is what most people enjoy for breakfast. It is not overly strong, but just right for a wake-up call. Organic is such a big draw where we are located. People ask for organic and are willing to pay a little more for it. The bonus is they like the flavor. This English breakfast tea is very good! I highly recommend it for anybody who only drinks organic or people who don't care either way! It it taste great and produces a great product! This is a pretty nice tea with great mild flavor. The tea bags are nicely filled. For the price this is a good deal. Good product.